The foot has a moist pad (arolium), which can stick to a surface like wet paper to a window. This is between two claws, shaped like a bull’s horns. If the surface is rough, the claws can catch onto a surface, and the arolium is retracted because it’s not needed, and is protected from abrasion. But on a smooth surface where the claws can’t catch onto anything, they retract via the claw flexor tendon, which also causes the arolium to rotate and extend into position. This tendon also connects to a plate that squeezes a reservoir of ‘blood’ (hemolymph), forcing the liquid into the arolium to inflate it, so it presses on the surface. When the foot needs to become unstuck, the claw flexor tendon is released, and the arolium and many of the mechanical parts are so elastic that they quickly spring back into place. The same basic mechanism applies to both bees and ants, but they have some differently shaped parts because of their different requirements. This would not be the first time that mankind has copied God’s original ingenious created design—usually without giving Him the glory.3 The ‘inventor’ of Velcro, for instance, was inspired by a similar system in plants. 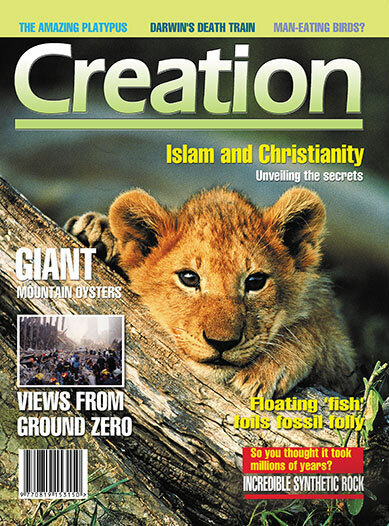 The animal kingdom had jet propulsion long before any person thought of it, and lobster eyes have inspired x-ray telescopes (see Lobster Eyes: brilliant geometric design, Creation 23(3):12–13, 2001), to name but a few. The more our increasingly sophisticated research techniques enable us to find out about creation, the more we discover of the brilliance, depth and ingenuity of God’s original created designs, which man then struggles to copy. Schubert, C., Insects deploy sticky feet with precision, Science News, 2 June 2001, p. 341. Return to text. 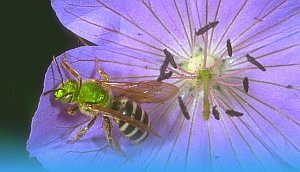 A sticky situation for ants and bees: UMass biologist looks at how these insects adhere to various surfaces, University of Massachusetts at Amherst, sciencedaily.com, 17 December 2001. Return to text. Federle, W. et al., Biomechanics of the movable pretarsal adhesive organ in ants and bees, PNAS USA 98(11):6215–6220, 22 May 2001. Return to text.